Some of the most progressive and interesting science happens when experts from different fields come together to tackle the same problem. Recently a group of plankton ecologists teamed up with some palaeontologists to assess how climate change impacts the growth of specific species of coccolithophores, both in modern times and during a period of warming 56 million years ago. 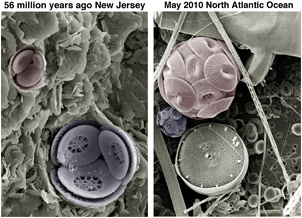 They showed that two species of coccolithophore responded very differently to this event. Coccolithophores are a single-celled group of phytoplankton that are often covered in calcium carbonate scales called coccoliths. This group of phytoplankton play an important role in the carbon cycle because they remove CO2 from the atmosphere. 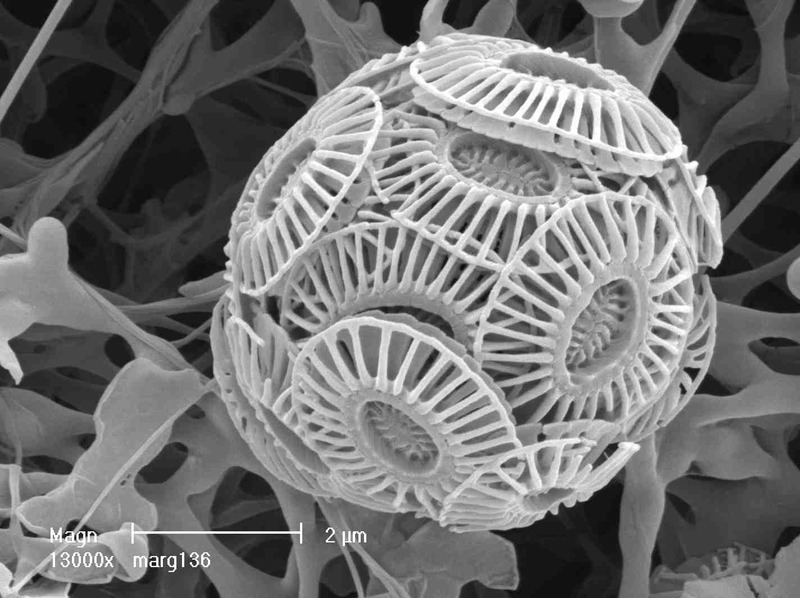 Across all the species of coccolithophores there is staggeringly high diversity in size and shape. Some species have coccoliths shaped like gramophone speakers, while others species have coccoliths that are more like dinner plates (some more ornate than others). It is these calcium carbonate coccoliths that make coccolithophores so easy to study in the fossil record. 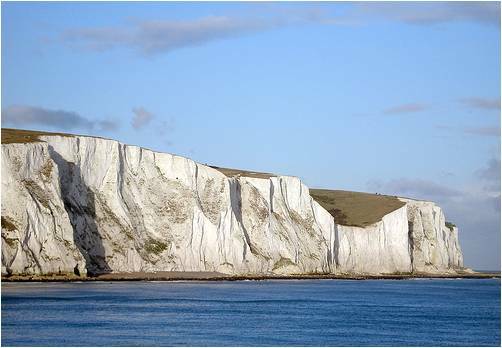 They are so abundant, that over thousands of years of sedimentation, they eventually formed the White Cliffs of Dover. The White Cliffs of Dover: created by coccolithophores. 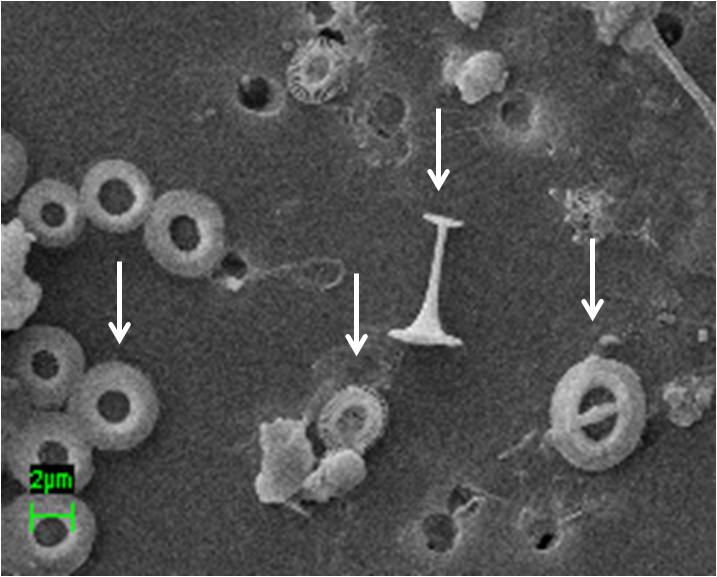 Even within a single species of coccolithophores there are variations in the size and shape of individual coccoliths; this variation is often related to differing environment factors. We also know that coccolithophores may be sensitive to a decrease in the pH of the ocean (ocean acidification): as atmospheric CO2 levels increase, oceanic pH decreases due to increased CO2 absorption (schematic below), potentially making coccoliths more soluble in seawater. In a recent article published in Nature Geoscience, scientists wanted to assess whether changes in the coccolithophore fossil records during an ancient climate warming event 56 million years ago could tell us anything about the impact of modern day climate change on coccolithophores. They used lab experiments to show that cell and coccolith sizes, and the number of coccoliths per cell, vary depending on how fast cells are growing. This allowed the team of researchers to take coccolith size and abundance data from the fossil record, and use it to understand how the growth rate of these organisms was affected by the ancient warming event. Fossil and modern coccolithophore cells of species Toweius pertusus and Coccolithus pelagicus. Courtesy of Paul Bown, UCL. One species, Toweius pertusus, which is closely related to the modern day species Emiliana huxleyi, maintained a high growth rate during the rapid change in environmental conditions. Maintaining a high rate of growth may have given it an advantage over other species that did not cope so well with the changing environmental conditions. Over longer time scales, that may explain why E. Huxleyi is still such a dominant species today. Another species, Coccolithus pelagicus, was affected by the changing conditions, and it had a reduced growth rate during this period. This could have had knock-on effects, reducing the evolutionary fitness of its modern day relatives. Using these findings, scientists can begin to understand how ancient environmental changes affected coccolithophores; they can apply that knowledge to current environmental changes, and better predict how coccolithophores may respond in the future. Collaborations, like the one that made this study possible, are so important for furthering our scientific knowledge. The UK Ocean Acidification (UKOA) Research Programme, which partially funded this work, is one such programme that supports and fosters this type of science.